SongFactory: taking the strain out of songwriting? Notorious Notes' SongFactory is a software application that takes an interesting approach to song creation; users input chords and set the tempo, and then the supplied samples are pitch- and timestretched to fit. The basic-looking interface adheres to standard DAW conventions. Chords are entered in the arrange area at the top, and samples can then be dragged in. Lyrics can be added, too. The samples have been given names such as Acoustic Start and Rock Verse, presumably to appeal to beginners who have no previous experience of music software. You can also record up to eight of your own audio tracks, set levels in the mixer and export in MP3, WAV and ogg formats. 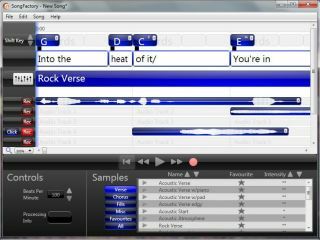 SongFactory costs £49.99, and a 14-day demo is available.